The radiocephalic and brachiocephalic autogenous access approaches are first-line options for dialysis access and listed as “preferred” access by the National Kidney Foundation Dialysis Outcome Quality Initiative (K/DOQI) most recent 2006 guidelines. Both have superior long-term patency to prosthetic grafts in meta-analyses. This chapter focuses on direct anastomosis cephalic vein hemodialysis access, techniques, patency, and outcomes. NKF KDOQI Guidelines 2006 [Internet]. [cited 2015 Apr 20]. Available from: http://www2.kidney.org/professionals/KDOQI/guideline_upHD_PD_VA/va_ref.htm#ref23. Wolowczyk L, Williams AJ, Donovan KL, Gibbons CP. The snuffbox arteriovenous fistula for vascular access. Eur J Vasc Endovasc Surg [Internet]. 2000 Jan [cited 2015 May 6];19(1):70–6. Available from: http://www.sciencedirect.com/science/article/pii/S1078588499909693. Twine CP, Haidermota M, Woolgar JD, Gibbons CP, Davies CG. A scoring system (DISTAL) for predicting failure of snuffbox arteriovenous fistulas. Eur J Vasc Endovasc Surg [Internet]. 2012 Jul [cited 2015 May 13];44(1):88–91. Available from: http://www.sciencedirect.com/science/article/pii/S1078588412001839. Robbin ML, Chamberlain NE, Lockhart ME, Gallichio MH, Young CJ, Deierhoi MH, et al. Hemodialysis arteriovenous fistula maturity : US evaluation. Radiology [Internet]. Radiolo Soc North Am. 2002 Oct 1 [cited 2015 May 6];225(6):59–64. Available from: http://pubs.rsna.org/doi/citedby/10.1148/radiol.2251011367. Sparks SR, VanderLinden JL, Gnanadev DA, Smith JW, Bunt TJ. Superior patency of perforating antecubital vein arteriovenous fistulae for hemodialysis. Ann Vasc Surg [Internet]. 1997 Mar [cited 2015 May 6];11(2):165–7. Available from: http://www.sciencedirect.com/science/article/pii/S0890509606615720. Maeda K, Furukawa A, Yamasaki M, Murata K. Percutaneous transluminal angioplasty for Brescia-Cimino hemodialysis fistula dysfunction: technical success rate, patency rate and factors that influence the results. Eur J Radiol [Internet]. 2005 Jun [cited 2015 May 11];54(3):426–30. Available from: http://www.sciencedirect.com/science/article/pii/S0720048X04002670. Heye S, Maleux G, Vaninbroukx J, Claes K, Kuypers D, Oyen R. Factors influencing technical success and outcome of percutaneous balloon angioplasty in de novo native hemodialysis arteriovenous fistulas. Eur J Radiol [Internet]. 2012 Sep [cited 2015 May 11];81(9):2298–303. Available from: http://www.sciencedirect.com/science/article/pii/S0720048X11006863. Feezor RJ, Huber TS. Chapter 249. 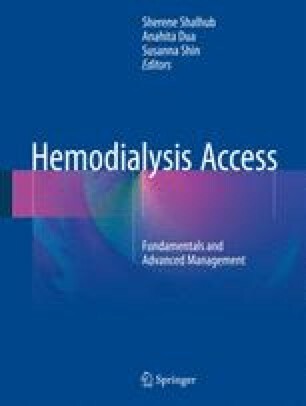 Autogenous arteriovenous hemodialysis access. In: Fischer JE, Jones DB, Pomposelli FB, Upchurch Jr. GR, Klimberg VS, Schwaitzberg SD, et al., editors. Fischer’s mastery of surgery [Internet]. 6th ed. Philadelphia: Wolters Kluwer/Lippincott Williams & Wilkins; 2012 [cited 2015 Apr 20]. Available from: http://www.surgicalcore.org/chapter/183797. Al-Jaishi AA, Oliver MJ, Thomas SM, Lok CE, Zhang JC, Garg AX, et al. Patency rates of the arteriovenous fistula for hemodialysis: a systematic review and meta-analysis. Am J Kidney Dis [Internet]. 2014 Mar [cited 2015 May 4];63(3):464–78. Available from: http://www.sciencedirect.com/science/article/pii/S0272638613012183. Voormolen EHJ, Jahrome AK, Bartels LW, Moll FL, Mali WP, Blankestijn PJ. Nonmaturation of arm arteriovenous fistulas for hemodialysis access: A systematic review of risk factors and results of early treatment. J Vasc Surg [Internet]. 2009 May [cited 2015 May 12];49(5):1325–36. Available from: http://www.sciencedirect.com/science/article/pii/S0741521408019939. Huber TS, Carter JW, Carter RL, Seeger JM. Patency of autogenous and polytetrafluoroethylene upper extremity arteriovenous hemodialysis accesses: a systematic review. J Vasc Surg [Internet]. 2003 Nov [cited 2015 May 12];38(5):1005–11. Available from: http://www.sciencedirect.com/science/article/pii/S0741521403004269. Murad MH, Elamin MB, Sidawy AN, Malaga G, Rizvi AZ, Flynn DN, et al. Autogenous versus prosthetic vascular access for hemodialysis: a systematic review and meta-analysis. J Vasc Surg [Internet]. 2008 Nov [cited 2015 May 12];48(5 Suppl):34S–47S. Available from: http://www.sciencedirect.com/science/article/pii/S0741521408013955. Smith GE, Gohil R, Chetter IC. Factors affecting the patency of arteriovenous fistulas for dialysis access. J Vasc Surg [Internet]. 2012 Mar [cited 2015 May 12];55(3):849–55. Available from: http://www.sciencedirect.com/science/article/pii/S074152141101857X.